One of the most basic steps that is used in every ballet class is a tendu. It is a step in ballet that lays down the foundation for more complex and difficult movements. We were taught at an early age exactly how to tendu. When we were little, we thought this was just a typical, easy, step. It consisted of reaching out and extending our leg as far as we could while pointing and brushing our feet on the ground either to the front, side, or back. Little did we know, however, it actually uses the entirety of the human body and is extremely complex. A tendu can start in any of the five ballet positions, however, this photo essay examines a tendu a la seconde from first position. Let’s break down the details of the anatomy that contributes in executing an excellent tendu. When performing a tendu, one must begin by standing tall in a turned out first position. Correct placement of the feet in first position. When standing in a turned out first position, the foot is in abduction because the toes are pointing away laterally from the median plane. The heels although remain together, in line with the center of gravity. The foot is also in dorsiflexion because there is a decrease in the angle between the superior surface of the foot and the anterior leg. The ankle is stable when standing in first position and the posterior ligaments of the ankle are taut as the anterior ones are slackened because the foot is in dorsiflexion. There should be no pronation or supination happening in the foot and ankle. The upper leg, technically the hips, are also holding this turned out position. The primary hip flexors that allow this to happen are the psoas major and the iliacus. The hip contains six deep lateral rotators that allow the foot and leg to stay turned out through the whole movement. The lateral rotators are: piriformis, obturator internus, obturator externus, gemellus superior, gemellus inferior, and quadratus femoris. These are muscles that lay deep to the gluteus maximus muscles. They are inserted near the greater trochanter of the femur. These six deep lateral rotators are mainly responsible for turn out in the leg, especially since they are much closer to the hip joints. The adductor brevis and adductor longus, and tensor fasciae latae (TFL), which are located on the medial thigh, are also activated in lateral rotation. The TFL muscle flexes, adducts, and medially rotates the thigh due to a connective tissue known as the iliotibial band (IT band) that is attached from the ilia of the pelvis to the lateral side of the knee. This band is what helps the working leg do a tendu a la seconde while maintaining the leg turned out. If it were not for this small flexor muscle, the phrase “turned out” would have not existed in the dance world as the legs would have little to no movements that could be made. It is important for the hip to be in lateral rotation to allow for a greater range of motion. The greater range of motion is due to the fact that the femoral head and neck are shifting and moving toward the posterior within the acetabulum. This turned out position must be held while the working leg begins to move. The working leg, or the one that is going to be in a la seconde, will push into the ground while moving away from the midline (abducting). As the superior and posterior muscles of the foot move the leg, the calcaneus, with the help of the Achilles tendon and triceps surae, is pushed off the ground while the metatarsal region and phalanges stay on the ground. After the calcaneus is lifted off the ground, the lumbrical and quadratus plantae muscles lift the metatarsal region up off the ground as well. This leaves the phalanges on the ground. The last part of the tendu is to point the toes. The dorsal interosseous and plantar interossei muscles are activated to bring the toes and foot to plantar flexion. The flexor hallucis brevis which is on either side of the proximal phalanx is activated and helps with the plantar flexion of proximal phalanx of the big toe. There are many muscles higher in the leg that help achieve this plantar flexion of the foot. The ankle begins to point before the foot and toes reach full plantar flexion. The talus and cuneiform bones, which form the ankle joint, start to extend with help of the gastrocnemius (calf muscle), plantaris, flexor hallucis longus, and flexor digitorum longus muscles. When the gastrocnemius is contracted, the ankle will extend, causing the foot to go into plantar flexion. All these muscles work together in plantar flexion to help the body stay balanced and stable. Vastus lateralis, vastus medialis, and rectus femoris are part of the quadricep muscle group that straighten the knee and provide stability to both the working and non working leg. The triceps surae which helps point and flex the foot is constantly working on the posterior side of the lower leg. The triceps surae starts in the upper calf and extends all the way down to the top of the heel. The FHL, or the flexor hallucis longus, plays a big role as well. It begins at the calf and stretches all the way through the bottom of the foot and connects to the big toe, this muscle is crucial for an accurate tendu. The muscle fibers used in a tendu a la seconde depend on how the tendu is executed; this specific movement could either use type one muscle fibers or type II muscle fibers. A slow warm up exercise incorporating tendus would use type I fibers and be aerobic. Tendus that are used in faster combinations would use type II fibers, or fast twitch muscles, and be anaerobic. Although this specific essay focuses on the inferior half of the body in a tendu, It is important to understand that a tendu is a total body movement, and that the knee, hip, shoulder, elbow, and wrist are all involved in this movement in addition to the foot and ankle. With the dancer extending, or pushing into the ground, lengthening her working leg, she will brush the floor and bring her leg a la seconde. While her leg is doing this, her arms will reach and lengthen down and swoop up into second position. The reasoning for this lengthening of the muscles in the legs and arms is to enable the muscles to engage and support each other. They contract as the arm and leg rise. Dancers are prone to injury when their technique is performed incorrectly. It is always important for a dancer to make sure that they are laterally rotating from the hips rather than forcing their turnout from the feet when doing a tendu. This will prevent pain and injury. A dancer must keep the pelvis and hips in a fixed alignment and prevent from tilting forward or back. This makes it easier for the working leg to push into the ground while abducting from the medial line of the body to ultimately remain in turn out. If the pelvis is hiked on the working leg, it causes a lot of weight on the supporting leg which can lead to injury to the hip joints. Incorrect placement of the feet and pelvis in first position. Another way of using improper turnout would be if a dancer were gripping their gluteus maximus, which can cause tucking, also known as a posterior pelvic tilt. It may be natural for a dance teacher to tell dancers to “squeeze their butts” when they want them to keep their pelvises from an anterior tilt. In such a position, the anterior superior iliac spine is pointed towards the ground and the ischial tuberosity is pointed straight to the posterior of the body. This action could eventually cause long term damage on the sacrum, or the 4th and 5th lumbar vertebra. Furthermore, the gluteus maximus is a superficial muscle that does not help in the rotation of the hips. Misplacements are also common in the feet when performing a tendu which can lead to injuries as well. “Rolling,” or pronation, occurs when the foot rolls inward. Pronation of the feet in first position. Over-pronation in dancers can be a result of overcompensating for a lack of external hip rotation. When a dancer wants to strive for a perfect 180 degree turnout, they cheat by turning out from their feet instead of turning out from their hips. When the feet are pronated in, it irritates the flexor hallucis longus tendon (FHL), which can cause tendonitis. Ideally, the dancer should stand in a ‘neutral’ position with three points of contact (first and fifth metatarsals and heel) on the floor whenever possible. By doing this, hopefully the foot and leg pain can be saved from injury. 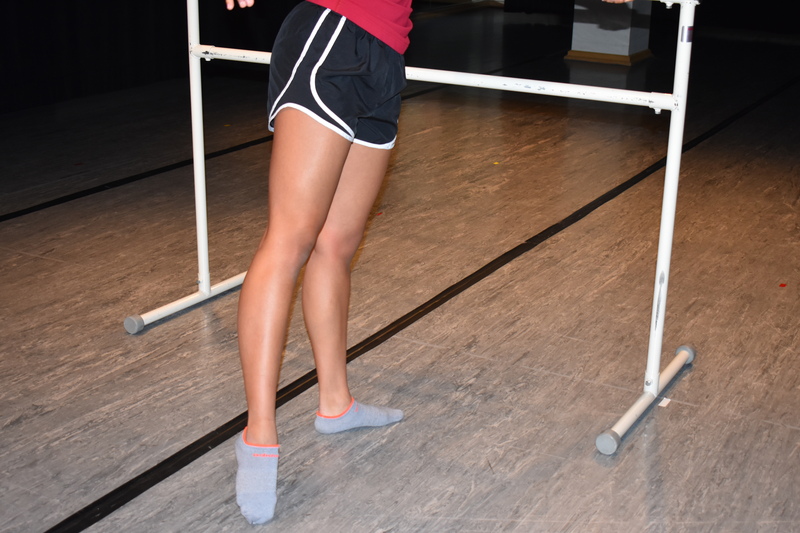 Strength of muscles, flexibility, and the ability to balance on one leg hinders the movement of a tendu. The entire body is centered on the single foot. It is currently in a more relaxed dorsiflexion position with as much weight on the first and fifth metatarsophalangeal joint (MTP) and not on the calcaneus. This is so the foot would be able to rise to relevé at any moment. It is important to know the correct anatomical placement and details of how to achieve a tendu to gain strength, have precise placement, and to prevent injuries in the future. By reading this essay, you should be ready to conquer a top-notch tendu in your next ballet class. Calais-Germain, Blandine. Anatomy of Movement by Blandine Calais-Germain, 2nd Edition. Cram101, Inc., 2013. Photographs by the authors are of Tiana Thompson. Used with permission. Molly Gehrmann is a native of Sun Prairie, Wisconsin and is currently a sophomore dance major at Loyola University Chicago with minors in Musical Theatre and Film and Digital Media. She has a strong passion for dancing and performing. Molly has recently travelled to Rome, Italy to train and perform with the Mandala Dance Company. She has a long term goal of opening a dance acedemy of her own to allow boys and girls to find a passion in dance while developing their own inner-self. Molly Walker is a Freshman Dance Major at Loyola University Chicago from Memphis, Tennessee. She has been dancing for fifteen years, and has performed around the country with New Ballet Ensemble, American Ballet Theatre, and The Joffrey Ballet School. She has performed in works such as The Nutcracker, Coppelia, Sleeping Beauty, Panorama, and Fearless Mine. In the future, she hopes to join a dance company and travel the world on tour.